Glucose Transporter Type 1 Deficiency Syndrome is a genetic disorder that impairs brain metabolism. Glucose isn’t transported properly into the brain, leaving it starving for the energy it needs to grow and function. 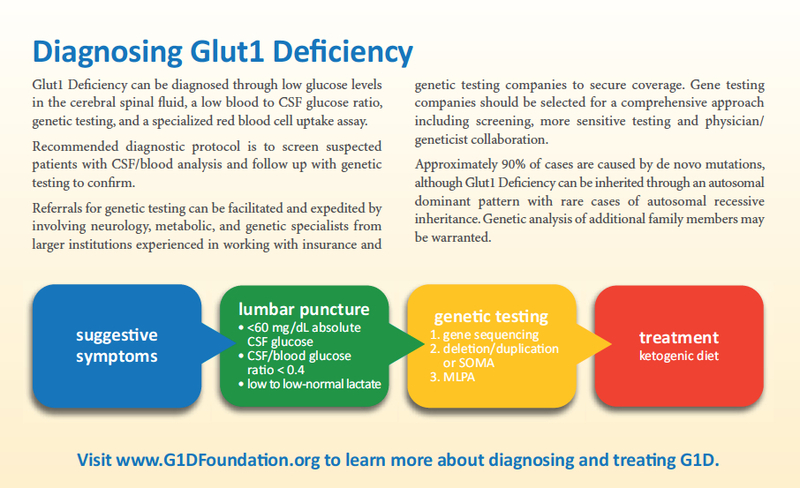 The impaired glucose transport associated with Glut1 Deficiency causes an array of symptoms which may vary considerably from one patient to another. Some signs and symptoms may include seizures, movement disorders, speech and language disorders, and developmental delays. There are currently a few hundred patients diagnosed worldwide, but experts believe there are thousands more yet to be discovered. There is no cure for Glut1 Deficiency. The current standard of care treatment is a ketogenic diet, which helps improve most symptoms for most patients by giving the brain an alternate source of energy and helps optimize brain growth and development.